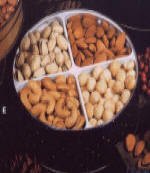 It's all about nuts and all about you and pure pleasure. Cashews, almonds, pistachios and macadamia nuts, specially roasted and slightly salted in our old fashioned roasters to bring out the ultimate flavor of these popular nuts. These fine pretzels covered with caramel have made themselves known to caramel lovers and other fans simply by creating a unique and exciting new taste dimension. 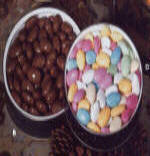 Sweet extra fancy Jordan almonds are colorful, crunchy and taste as good as they look. They are the perfect gift for any occasion. 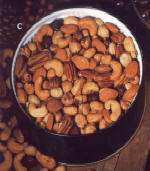 Every nut is treated like a celebrity when hey are roasted daily in our special old fashioned roasters. 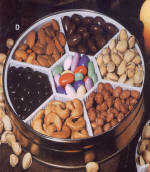 Only the best nuts are featured. They are famous, bigger than life and filled with tasty surprises. Available raw, roasted unsalted and roasted salted. Coffee lovers and chocolate fans will appreciate this out of the world taste. 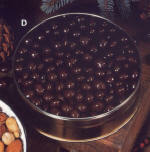 Real European style roasted espresso coffee beans covered all over with rich dark chocolate is the center of any gathering. 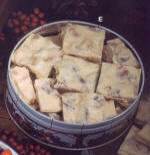 A delightful combination of creamy white chocolate and our special roasted nuts. A perfect combination that keeps everyone asking for more. 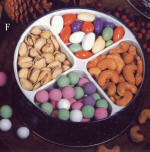 Jumbo cashews chocolate Jordan almonds, crisp California pistachios and chocolate Dutch mints. 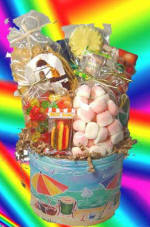 A wheel full with fortunes of delight for the lucky person who receives it. Roasted almonds, chocolate espresso beans, cashews, butter toffee peanuts, pistachios, milk chocolate almonds and chocolate Jordan almonds become a delightful mix. Fruit gets a total new look and taste when dipped in chocolate especially if they are sun ripened Australian glazed apricots hand dipped in white and dark chocolate. It's a luxurious taste you won't soon forget. 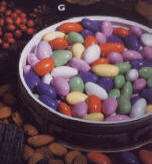 Fresh roasted almonds are covered with a special blend of rich creamy milk chocolate. A sensational sinful flavor combination you won't soon forget. combination is a joy of flavorful fun in every bite. To our pistachios lovers. We created a special gift you won't find any other place. 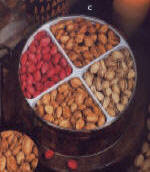 Four kinds of California gigantic pistachios including garlic pistachios, red pistachios, chili-lemon hot pistachios and our famous classic roasted and salted pistachios. This delicious chocolate and yogurt pretzels known for chocolate lovers and other fans simply by creating new taste dimension. The price for small tin is: $14.00 et wt. 9 oz. 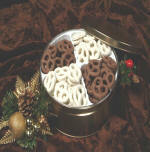 The price for medium tin is: $19.00 et wt. 1lbs. 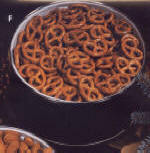 The price for large tin is: $25.00 et wt. 1 lbs 702. Are your kids away at college? 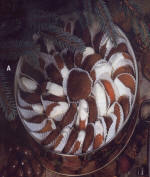 Are they getting enough to eat? 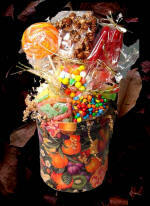 nacho chips, Elite chocolate bar, gummy hamburger, gummy hotdog sour belts, chocolate flowers, strawberry puff and assorted gummy bear.